Seriously, it was so hot here this weekend that we did not even want to do anything. Saturday was a blazing 103 (heat index made it feel like 110ish). Then, Sunday cooled off to a balmy 95. We spent a lot of time running errands in highly air-conditioned locations. Plus, it was cool enough to go to the pool around 4pm- and at this time the pool is partly in the shade. Speaking of the pool, Miss H had another swim lesson this weekend. 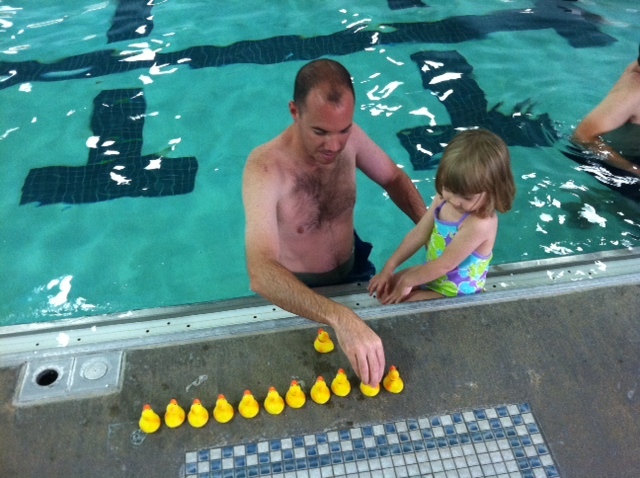 She would not get into the pool until the rubber ducks were nicely lined up on the side. If you know Kerry, this probably makes you laugh. Miss H seems to have issue with her swimming class because it is not advanced enough. The class next to her class gets to use kickboards and water dumbbells. 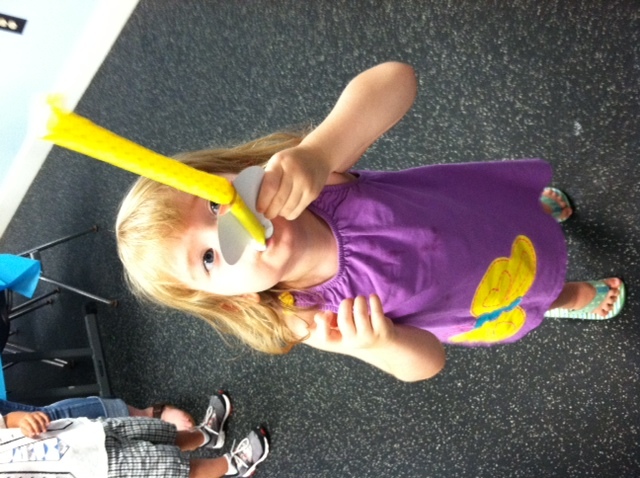 Her class sings songs and chases rubber ducks. She even loudly exclaimed that she does not want to ‘be in the baby class!’ She wants to ‘be in the kickboard class!’ Of course, I see her point but we are stuck in this class for now. 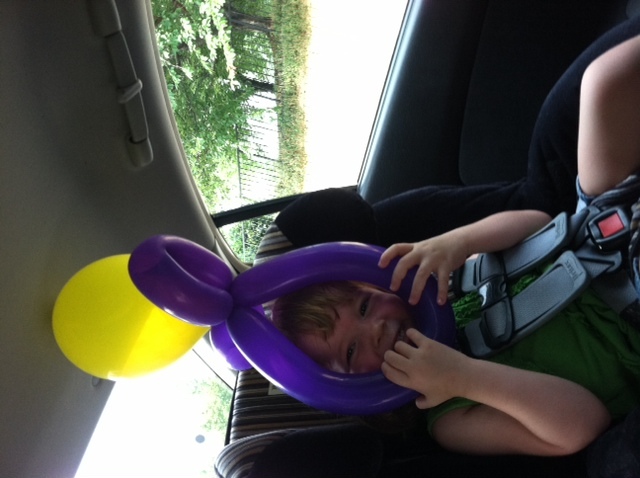 After swimming lessons we headed to the farmer’s market to load up on blueberries, blackberries, corn and cucumbers plus they were giving away balloon animals, flowers and swords. Her flower makes for a perfect hat. To finish off the weekend, we headed to Bethesda for a friend’s 2nd birthday. 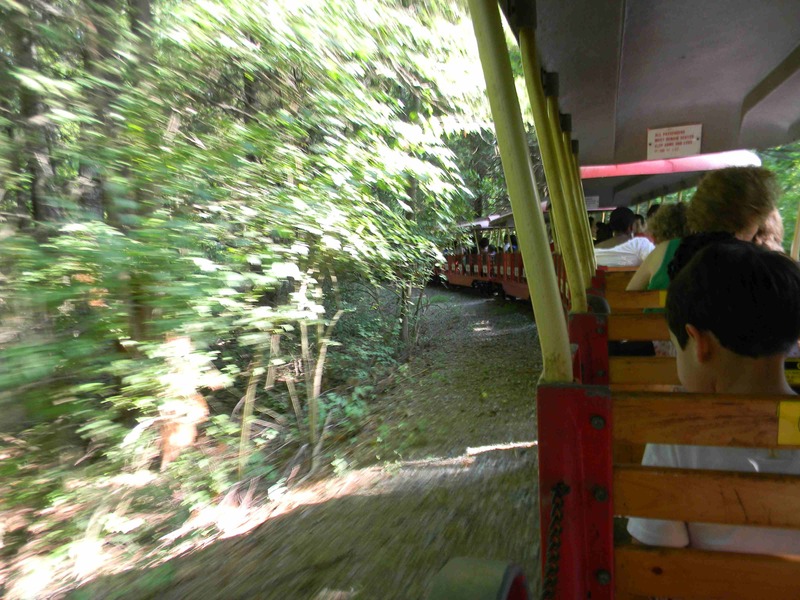 The Cabin John Regional Park was a perfect location plus they have a train. It seems like all kiddos this age have an obsession with trains! This crew was not interested in cake, balloons or anything else party related- just the train. Miss H took charge and got everyone boarded with her ‘all aboard! Ready to go!’ The whole train was filled with the party-goers. 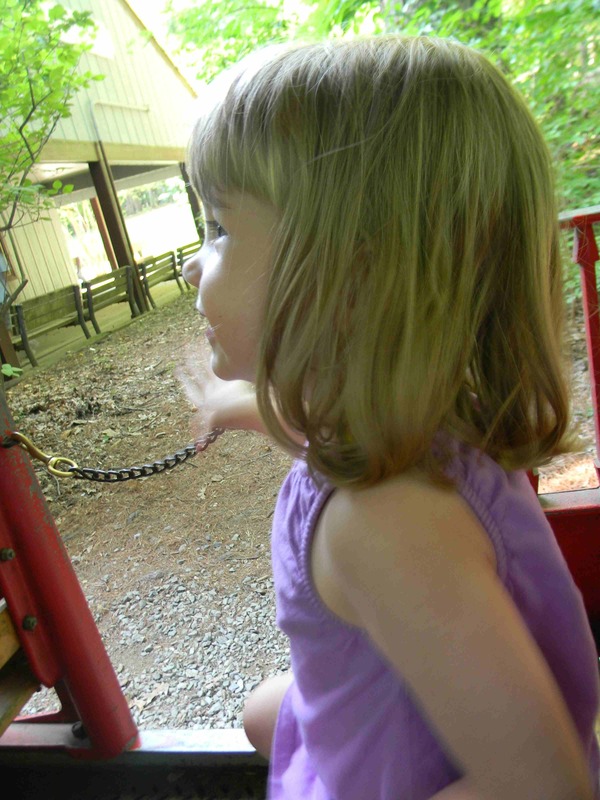 We rode on the caboose and Miss H is still talking about the train. In my 10+ years living in Bethesda, I never knew this park exsisted! But, I guess I never had reason to ride a train through a huge park and visit a really cool playground. The birthday party was a lot of fun! The parents thought it was funny that there was very little interest in the cake but the cauliflower, carrots, celery and cucumbers were HUGE hits. I think Mss H ate enough veggies to fill her up for the rest of the month. After all this excitement, we were all exhausted.